The Ready Store is excited to announce that they are proud sponsors of the Olive Osmond Hearing Fund to help local children who are in need receive hearing aids! The Olive Osmond Hearing Fund is dedicated to promoting hearing-health awareness by providing educational resources and accommodating the needs of those who live with hearing loss. 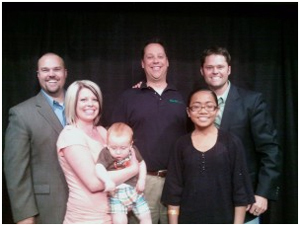 The organization is run by Justin Osmond, son of Merrill & Mary Osmond. Jeff Davis, owner of The Ready Store, attended an event where Justin spoke about being deaf in such a musically famous family. Jeff has a son who is also hearing impaired and after hearing Justin share his own story, Jeff wanted to join his cause!“I know how hard that can be on families,” Jeff said. “When we found out our son had hearing loss, it was a difficult thing to deal with. How was that going to affect his life? Research has shown that the younger the child’s age when receiving a hearing device, the easier it will be for him or her to learn to hear and speak in the future. The Ready Store is proud to be a founding sponsor of the Olive Osmond Hearing Fund. We are excited to assist in giving the gift of hearing to children in need. Check out this video of when the Olive Osmond Hearing Fund helped this boy hear for the first time. The Olive Osmond Hearing Fund is organizing the inaugural Youth Pioneer Pageant at the West Jordan Arena, July 20, 21, 23 and 24. Proceeds for the event will provide top-of-the-line hearing aids to local children who will hear for the first time at the pageant! The pageant will bring over 200 children from the community together to perform on stage. The event will also include fireworks, entertainment, food and much more. Besides the Youth Pioneer Pageant, The West Jordan Concert Series is also hosting some big names in concerts They include hit artists like country star Clay Walker, the Osmond Brothers, Jo Dee Messina, Colin Raye and more! You can purchase tickets for Clay Walker’s May 12th show through WJConcerts.com or smithxtix.com. Tickets range from $10 – $20. All the proceeds go towards helping children hear! Like the Olive Osmond Hearing Fund! You can visit the Olive Osmond Hearing Fund and donate to the cause! Visit their website at oliveosmond.org. You can also “like” them on facebook at facebook.com/oophfund.